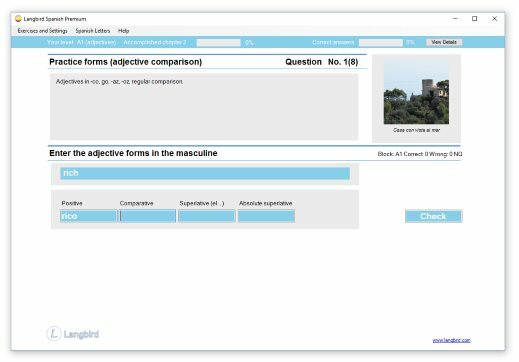 Learn Spanish verbs with effective exercises. You learn words from common situations and expand your vocabulary with other common verbs. Effective Spanish exercises let you practice thousands of Spanish verbs in the infinitive. Practice complete conjugations and learn irregularities. You practice the principal parts of all Spanish type verbs and learn how to conjugate all verbs of modern Spanish. Learn the Spanish verbs you need to speak fluently. You practice the basic forms of verbs (the infinitive), their declensions and principal parts. All unique declensions in modern Spanish are included in Langbird. When you learn Spanish, you need to know the conjugation of verbs.